Who Is Today’s “Man of a Thousand Faces”? Actor Lon Chaney was the movies’ original “Man of a Thousand Faces.” Who is the man (or woman) of a thousand faces today? “Don’t step on that spider!” a popular joke in the 1920s went. “It might be Lon Chaney!” For film fans of the Roaring Twenties, Lon Chaney, “The Man of a Thousand Faces,” could be anything—a terrifying Phantom of the Opera, a snarling gangster, or a grotesque Hunchback of Notre Dame (shown above). Chaney, born April 1, 1883, essentially perfected the art of movie makeup, which, added to his immense acting skills, made him one of the most beloved actors of the Silent Film era. Every actor who’s used makeup to build a character since owes a debt to the legacy of Chaney. But who is the movies’ man (or woman) of a thousand faces today? Image: (Left) American actor Lon Chaney wearing a monster costume for director Tod Browning’s “lost” silent film, London After Midnight. Chaney wears a black suit and hat, large bat-like wings and monster teeth and makeup: he grimaces while raising his arms and spreading his wings. (Photo by Hulton Archive/Getty Images). (Right) 1922: American horror actor Lon Chaney (1883-1930) laughs at his comedy teeth whilst applying his make-up for the film Blind Bargain, directed by Wallace Worsley. (Photo via John Kobal Foundation/Getty Images). Chaney grew up in Colorado Springs, Colorado, the son of deaf parents. To communicate with them, Lon developed ways to speak with his hands and face, the perfect training for someone hoping to enter into films in the pre-dialogue days. After working on the stage for several years, Chaney found work as a supporting actor in Westerns and other film dramas. Having to do his own makeup in live theater, Chaney studied makeup techniques and developed several new ones of his own to create his many memorable characters, including the Vampire from Tod Browning’s “lost” silent film, London After Midnight (shown above). Who Chaney was beneath the makeup remained a mystery to the public. “Between pictures,” the actor claimed, “there is no Lon Chaney.” Some of that mystery was studio publicity at work, but Chaney himself was a very private man. Image: (Left) American actor Lon Chaney (1883-1930) plays the part of an ancient mandarin in his 1927 film Mr Wu, directed by William Nigh for MGM. (Photo by Hulton Archive/Getty Images). (Center) Circa 1926: Lon Chaney (1883-1930) with William Haines (1900-1973) in a scene from the film Tell It To The Marines, directed by George Hill. (Photo by Hulton Archive/Getty Images). (Right) 1930: Lon Chaney (1883-1930) known as the “man of a thousand faces” as he appears as Mrs. O'Grady in his first talking picture The Unholy Three, directed by Tod Browning for MGM. He died just prior to its release. (Photo by Hulton Archive/Getty Images). Beneath those “thousand faces,” however, Lon Chaney often revealed the same character—an outsider who hid emotional depths beneath the surface, including sadness over never, ever getting the girl. In Mr Wu (above left), Chaney sensitively depicted an Asian character—no small feat in the often racist films of the period. His makeup-less depiction (unless you count the uniform) of the tough Marine sergeant with a heart of gold in Tell It To The Marines won Chaney the honor of the branch naming him an honorary Marine. Even in drag, as he was in both the silent and sound remake of The Unholy Three, Chaney created characters that were more than just makeup. Chaney claimed that “the success of the makeup relied more on the placements of highlights and shadows, some not in the most obvious areas of the face.” In the same way, the nuance and shading Chaney gave to each character led viewers to find humanity in the less-obvious figures, the monsters we too quickly judge and dismiss. But who is the Lon Chaney of today’s films? Who is our “Man of a Thousand Faces”? Well, first of all, we should be asking in 2016 who the man or woman of a thousand faces is. Meryl Streep (shown above), Helen Mirren, and many other actresses certainly have the versatility to play any role, yet the opportunities for women to work under heavy makeup in films are slim. Women actresses continue to struggle with the reality that their appearance too often defines their position. For now, the horrible truth is that most monsters are played by men. 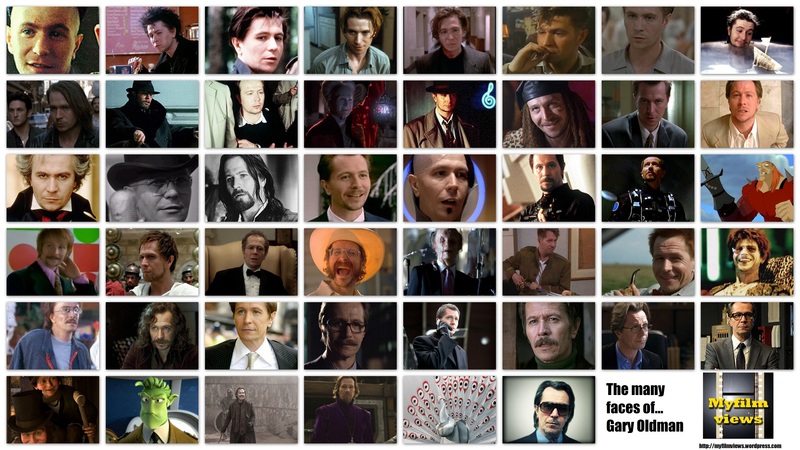 Take one look at this graphic of the many faces of Gary Oldman, for example, and you can see the gender imbalance in terms of transfigurating roles. Video: Actor Andy Serkis as Gollum in The Lord of the Rings film trilogy. Putting aside the gender issue for a moment, my money’s on Andy Serkis as today’s “Man of a Thousand Faces.” Serkis is the undisputed master of performance capture roles in which his voice and movements are used to create computer-generated characters that seamlessly interact with real-life actors. Serkis’ Gollum in The Lord of the Rings film trilogy owes as much to technology as to Serkis’ acting skills (as shown in the video above). Whether it’s playing Gollum in LOTR or Caesar in Rise of the Planet of the Apes or (most recently) Supreme Leader Snoke in Star Wars: The Force Awakens, Serkis always adds a human spark—often a conflicted one—to the character that no computer can generate. If Lon Chaney were working today, he’d most likely forgo putty and wigs for today’s cutting-edge technology in portraying his typical troubled, romantic outsiders. For both Chaney and Serkis, the most memorable and complex face among that thousand will always be their own, real face lurking beneath and giving life to all the others.